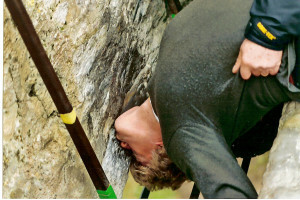 Some have jokingly said it was unnecessarily redundant, even dangerous, that I felt it necessary to kiss the Blarney stone, a block of bluestone found at the heights, in the parapet of the Blarney Castle, enchanted by the goddess Cliodhna, for its fabled gift of gab and flattery. You tip the kind strong rain-garbed guard who holds you from falling as you lean backward. We were told one soldier did fall, long before, perhaps after a pint, slipping between the walls, sliding to the ground, landing on his head, speeding him on his way to his final heavenly reward.